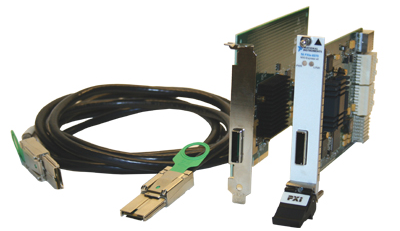 The MXIe PXI-Express Bus Expanders allows for direct control of PXI-Express systems from any PCI Express slot in a desktop computer or server. MXIe-Express configurations are available for supporting both the x1 and x4 PCI-Express lane configurations. Either lane configuration can remotely control one or two PXIExpress chassis. The MXIe-Express technology utilizes a high bandwidth link that is transparent to software applications and drivers, providing the ability to use high performance desktop computers or servers to control PXI-Express systems.